Thanh Kieu sounds pretty much like thank you in English. Quite a clever, catchy name for a resort when I think about it. Easy to remember, too. 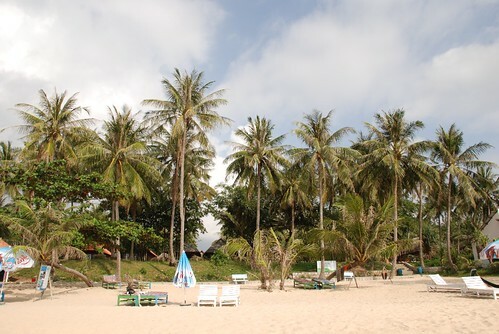 Thanh Kieu Resort in Phu Quoc is located right on the beach, hidden away from the dusty red clay road. Surrounded by a tropical garden of bamboos, palms and tropical plants and flowers, this hotel is a little piece of paradise that I really feel like keeping secret. 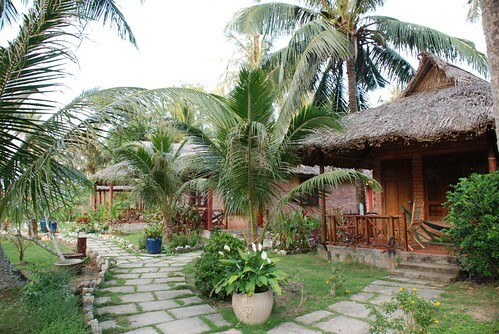 A family business where most of the staff is related to the owner, the accommodation consists of mostly thatch-roofed bungalows with terraces overlooking the beach. A couple of newer bungalows with tiled roofs have been built recently but are simply equipped in exactly the same way, with two beds and the necessary mosquito nets, fridges, fans and cold water bathrooms. 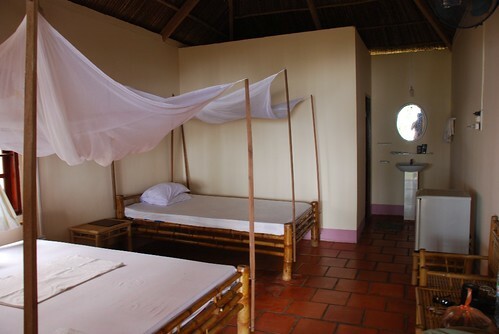 Well, to call it a resort might be a bit of an exaggeration but considering the beach is right outside, a hammock swings in the sea breeze and the weather is hot, there isn’t much call for a room with much more than the basics. Let’s just say, for me, it’s a resort. On the hotel’s beachfront, two coconut palms grow almost parallel to the sand. I could’ve sat all day observing the simple things around me, sipping on cold mango juice and taking the occasional dip in the sea. The thing is, though, that the hotel’s chief receptionist, Mr Tuan is rich with knowledge and ideas about how to while away the time on this island. But there is no pressure. I just appreciate it when I’m kept well-informed of the activities and places of interest on offer. When I was feeling energetic, I took his advice to visit the pepper farms and the beautiful deserted star beach. He also directed and accompanied me to the night market for a taste of the local seafood. Good service is hard to find sometimes. Not here. Established for around three years, no restaurant exists yet. This does not present any problems as the same plot of beachfront is occupied by the very casual Rainbow Bar. In the mornings, I just fell out of bed, wandered a few steps and ordered scrambled eggs on fresh round knots of bread. In the evenings, magnificent fresh seafood and tall cold bottles of beer were the perfect way to finish the day, whether it was an active one or a lazy one. 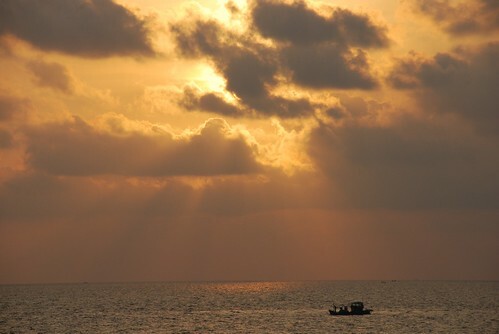 At night in bed, the fan whirs, the sea ebbs and flows and I think I must be dreaming. When I wake up, I realize it’s just another day in paradise. 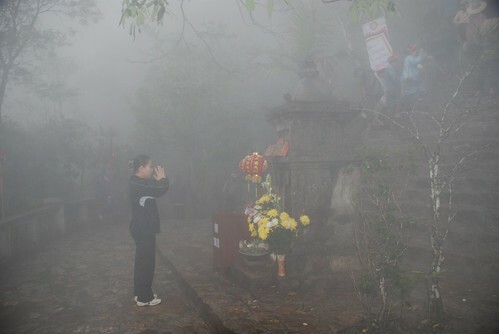 The weather at Yen Tu was terrible with heavy rain and strong winds on the morning of our climb. We had to buy simple plastic rain coats to keep warm. The rocks we were climbing over were really slippery so we had to climb up carefully. We were the first group at the cable car station but we weren't the first group on the top of the mountain as there were hundred of people already up there. I couldn't believe my eyes. If they were there that early it meant they had to climb during the night in the dark. They had all settled down to nonstop chanting in the rain with their raincoats on. It looked surreal. 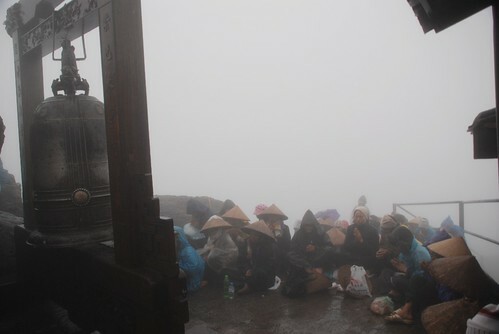 We were on the top of the mountain at the bronze pagoda and it seemed the wind would blow everything away any minute, including the chanting ladies in raincoats. It was also a little bit scary. This was truly a memorable trip for me. 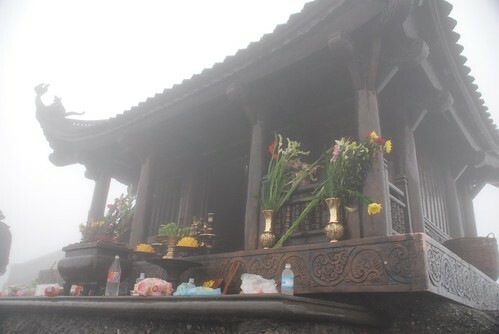 This small pagoda is made completely of bronze and everyone tries to reach the pagoda then touch it hopefully to get some blessing from the gods. I tried to take some photos but it was not difficult as there were too many people and also the strong wind and heavy rain. I was quite surprised about how religious these people were, some were 70 to 80 years old and had by-passed the cable car, choosing to walk from the base to the top in such horrible conditions. 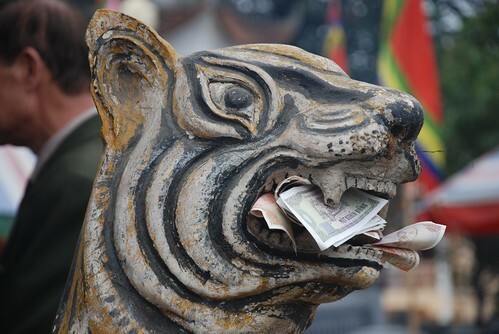 Some of them may not have been able to afford to buy tickets as it's quite expensive(140.000vnd). We stayed there for around 20 minutes and walked down again for lunch before heading to other temples and pagodas on the way back to Hanoi. I'm sure this would be a more beautiful place with amazing surrounding view if we came here on a clear day. Hope the weather is good on my second trip back. After almost 10 years, my mother returned to Hanoi for the first time. She was so excited about it as she could visit her home-town, her relatives and me. 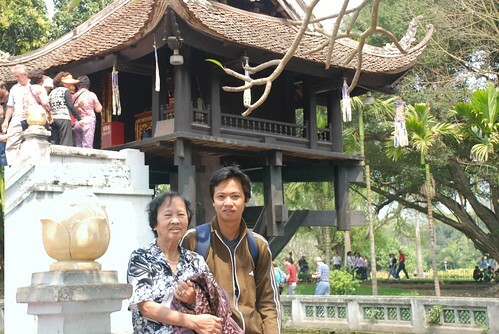 It was a great chance for me to show her around Hanoi and the north and do some pagoda trips during the special pagoda festival season. My mother is 73 this year and she loves traveling. In fact, when she worked for the government rice company, she took business trips on trains all overVietnam. But after she retired, she has had no time to do anything because she's been helping to raise my brother and sister's children. We decided to treat her to a trip abroad last year and she went to Malaysia and Singapore and really enjoyed it. She said to me that Hanoi has changed so much since her last trip here. 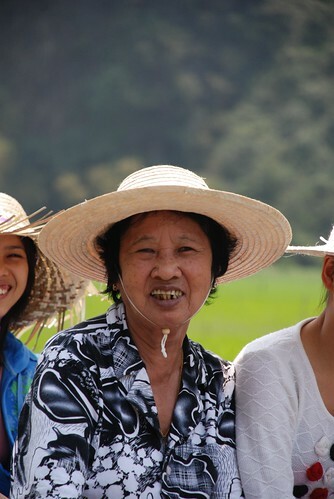 She's had many conversations about the changes in Hanoi to the taxi drivers, her relatives and even my foreign friends. My Mum's tour of Hanoi and the north has included Yen Tu Pagoda, Perfume Pagoda, Tam Dao, Ba Chua Kho, Tam Coc - Bich Dong and most of the interesting places around Hanoi plus eating Hanoi street food. I will write another post about her trips soon. 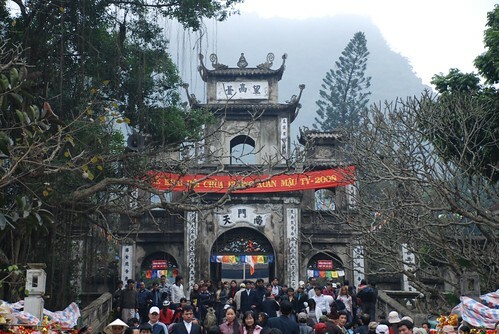 Last week, I joined a trip with my friend's company to Yen Tu Pagoda, the most holy and highest pagoda in the north and in fact, the whole of Vietnam. We started our trip at 3pm the day before and arrived at the base of the mountain after two and a half hours in the bus. The weather wasn't good as we expected as it was raining the whole day before and it meant the road was very wet, slippery and dangerous. 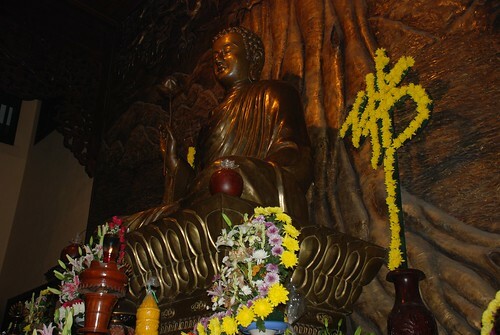 We stopped at a small temple on the way and then spent almost an hour at Thien Vien Pagoda. After that we went straight on to Giai Oan Temple for 15 minutes of praying to release whatever we had done wrong in the past year, before heading up to buy cable car tickets for the next day. We decided to sleep overnight on the chieu nghi(sleeping mats) in Ngoc Hai restaurant, right next to Hoa Yen Pagoda then take a cable car at 6 am the next day. We hired the whole second floor of the restaurant for the 39 people on the trip. A few of us stayed at the place to prepare the dinner while most of our group went to Hoa Yen Pagoda for a short prayer. The Sofitel Plaza staff, who I was invited to travel with, were really organized and had everything imaginable prepared, including a great dinner with lots of vegetables, cheeses, ham, boiled eggs, tofu with tomato sauce, chicken, square cake, sticky rice, bread, butter and of course, lots of wine, beer, soft drink and juice. I've never ever joined such a trip like this and just loved eating and talking with them. I found out that one of the ladies works in the hotel kitchen so no wonder she did it so amazingly well. After dinner, everyone went upstairs for a nap trying to save energy for the next day but only a few of the women went to bed as most people started playing games. I couldn't sleep very well because whenever someone won the game of cards a cheer went up. It seemed to keep going from 9 pm until 5am. It's truly amazing that they still looked fine the next day and walked so fast up to the top of the moutain. 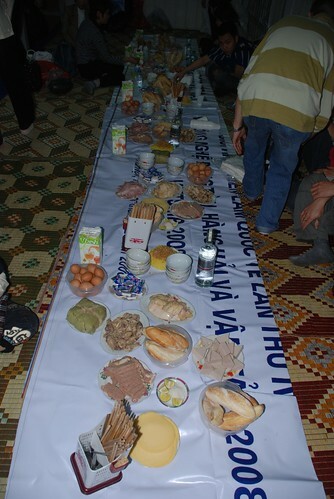 There must have been something special in the chicken porridge they had for breakfast.